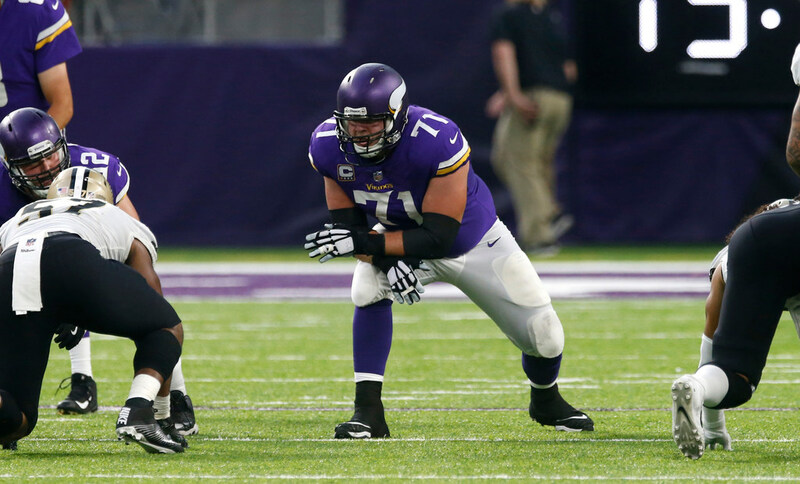 The Vikings will have left tackle Riley Reiff on Sunday against the Ravens. Reiff was questionable after he was added to the injury report Friday due to an ankle injury. He’s officially active. They will not have two receivers in Michael Floyd (hamstring) and Stefon Diggs (groin). That opens the door for rookie receiver Rodney Adams, who is active for his first NFL game against the Ravens. May he get his shot at kick returner? The Vikings had switched to receiver Stacy Coley in the 23-10 win against the Packers. Cornerback Mackensie Alexander (hip) is also inactive due to injury. The Vikings had two healthy scratches in defensive end Tashawn Bower and tackle Aviante Collins. Three Vikings starters were already ruled out after missing practice all week: QB Sam Bradford (knee), Diggs (groin) and LG Nick Easton (calf). Case Keenum and Jeremiah Sirles will start again for Bradford and Easton. Ravens (and former Vikings) receiver Mike Wallace was questionable due to a back injury, but is active and will play in his return to Minnesota. Ravens’ inactives:WR Breshad Perriman (concussion), OL Matt Skura (knee), TE Maxx Williams (ankle), RB Terrance West (calf), LB Tim Williams (thigh), WR Chris Matthews (thigh) and WR Jeremy Maclin.